The “Mother of All Car Seats” is built like a tank, and for good reason! Clek’s top of line convertible car seat is jam-packed with cutting edge safety features that other car seats can only aspire to have. Clek made no feature changes to the Foonf for 2019. However, they have improved the fabric choice for lining this cutting edge seat. All fabric colors (except Mammoth Wool) are now wrapped with C-Zero+ Performance fabrics, which offer: increased stain resistance, impermeability of liquids and spills, microbial technology, GREENGUARD Gold Certified and are all free of chlorinated and brominated flame retardants. The Mammoth Wool fabric remains unchanged and still naturally awesome! 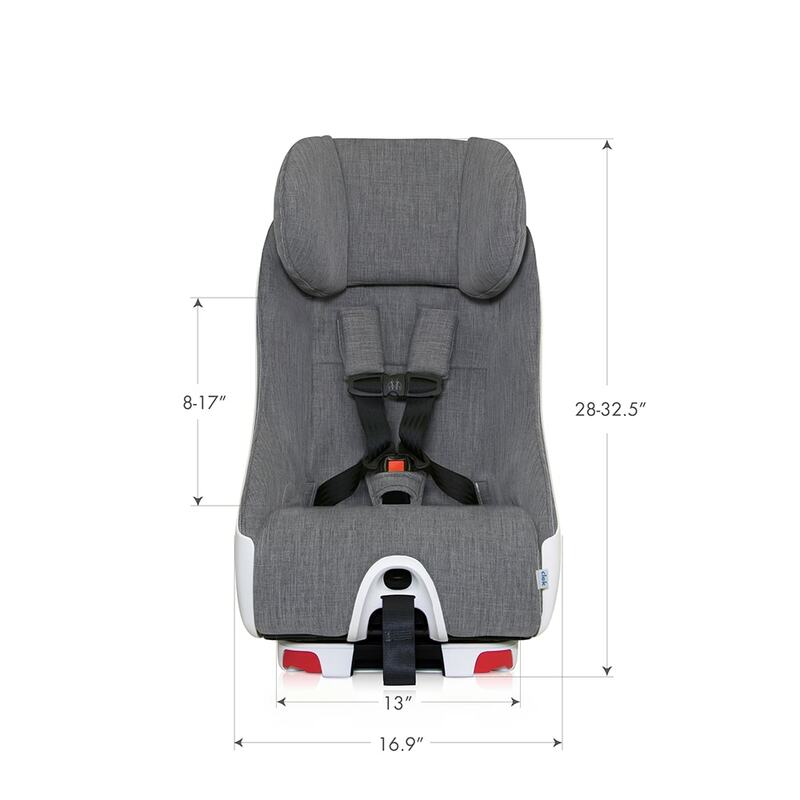 Extended Rear Facing – following international passenger safety practices, the Clek Foonf keeps your child rear facing longer than other car seats, up to 50 lbs. That’s 4 years for those who are counting! Anti-Rebound Bar– that’s ARB for short, but not short on safety! The Clek Foonf anti-rebound bar is essential in preventing rebound, either frontal or rotational in the event of collision. The ARB also improves seat installation by allowing the Foonf to nest firmly and evenly against the flat part of the vehicle seat. Secure Rear-Facing installation – a visible belt path, along with belt-tensioning lock-off clips under the seat cushion aid in removing excess slack from the seat belt. Effortless Installation – the Foonf’s patented Rigid-LATCH base provides an installation so secure, it’s almost like it was part of your vehicle – not to mention easy! Revolutionary Forward-Facing Safety – just like “crumple zones” in today’s vehicles, the Foonf has a smaller version of this safety technology in its base, referred to as REACT. The REACT safety system triggers in the event of a collision, thus reducing the forces transmitted to your child. Built like a Tank – Foonf’s steel and magnesium sub-structure, dual layers of energy-absorbing foam to maximize side-impact protection make it a car seat-engineering masterpiece. C-Zero+ Performance Fabrics – new age fabrics that use a fluorine-free solution for stain resistance while offering impermeability to liquids and spills, anti-microbial technology, and GREENGUARD Gold Certification. Oh, all while remaining free of chlorinated and brominated flame retardants. 100% Australian Merino Wool - a luxuriously soft fabric that has no flame-retardants and naturally keeps your child cool when it''s hot, and warm when it's not! 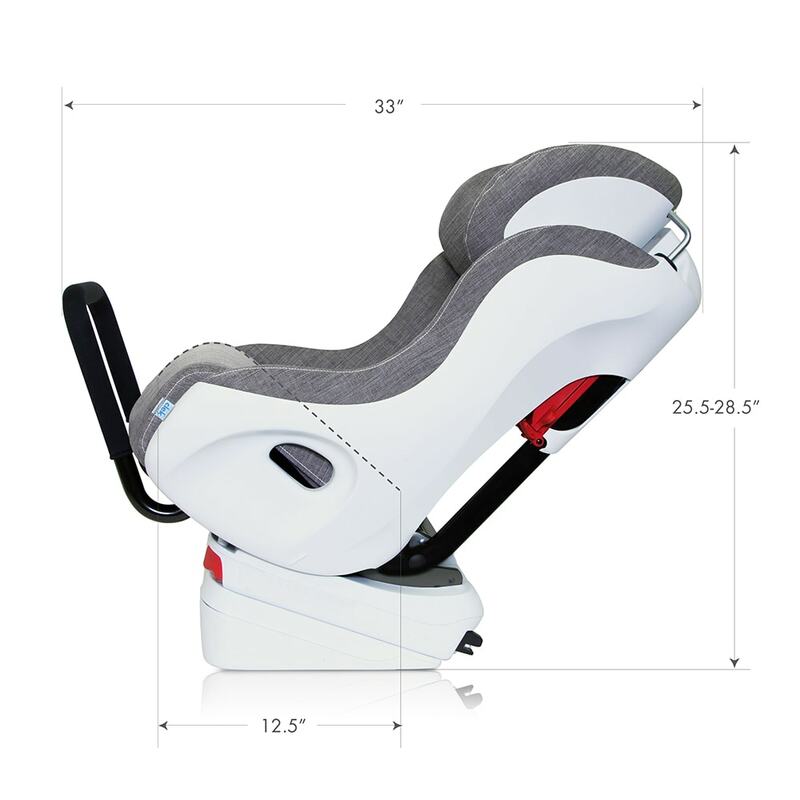 Smooth Recline – offering three different recline positions, the Clek Foonf provides a comfortable ride for your child. Adjustable Structural Headrest – energy absorbing foam and steel connecting rods make the headrest not only comfortable, but better yet, provides maximum head protection in the event of a side-impact collision. 3-Across Seating – with its slim physique of 16.9 inches wide, the Foonf can be easily installed 3-across in most vehicles. Industry Leading Warranty – a further commitment to Clek’s quality leadership position. Register your Foonf within 90 days of purchase and receive an additional 2 years of warranty protection. That’s 3 years total! Foonf conforms to all applicable Federal Motor Vehicle Safety Standards. Certified for use in motor vehicles and aircrafts. Foonf has a 9 year expiration from date of manufacture.